Diabetic Khichdi Recipes, Diabetic Brown Rice Recipes. Rice is a versatile grain, which lends itself well to the preparation of myriad dishes, right from our desi pulaos, khichdis and biryanis to international bestsellers. It is not surprising that many diabetics find it more difficult to reduce their rice intake than even give up sweets! Worry not, here we present you with a wonderful selection of rice recipes, prepared recipes using brown rice, recipes using bajra, recipes using whole wheat, recipes using buckwheat and other ingredients that are ideal for diabetics. So, browse this section to choose your favourite khichdi, biryanis and international rice recipes, to make your meal more satiating! Bajra is rich in Magnesium which improves insulin response by lowering insulin resistance which is good for Diabetics. Enjoy our bajra whole moong and green pea khichdi made without any rice. Whole wheat is excellent for diabetics as they will not shoot up your blood sugar levels as they are a low GI food. We have used it in gehun ki bikaneri khichdi recipe along with yellow moong dal. So again no use of rice here. Oats are high in fibre and again combine well with yellow moong dal to make a healthy oats khichdi recipe. Buckwheat keeps your heart healthy and high in fibre and diabetic friendly. Enjoy this buckwheat moong and vegetable khichdi recipe which will keep your blood sugar in control. High Fibre in Dalia aids in managing Diabetes. The high fiber further assists in controlling the levels of cholesterol too, thus reducing the risk of strokes. So dalia is well used in this vegetable bulgar wheat khichdi recipe which has a mix of vegetables that brings down the glycemic load. Use this basic brown rice recipe and toss in lots of vegetables or dals with it to make a healthier meal. We want you to use less brown rice and more vegetables or dals with fibre. The combinations are tons. For example you can add methi tovar dal or palak chana dal or toovar dal with onions recipe. 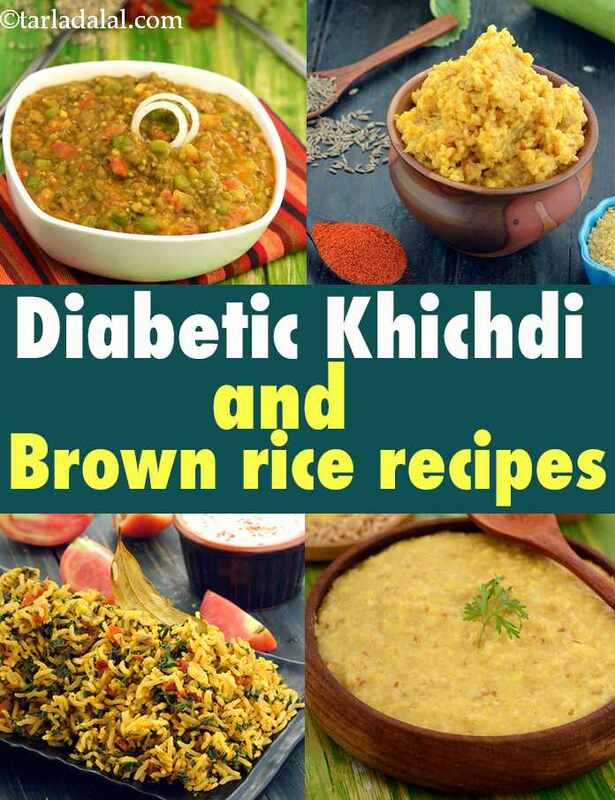 Enjoy our Diabetic Khichdi Recipes, Diabetic Brown Rice Recipes and other Diabetes articles below.